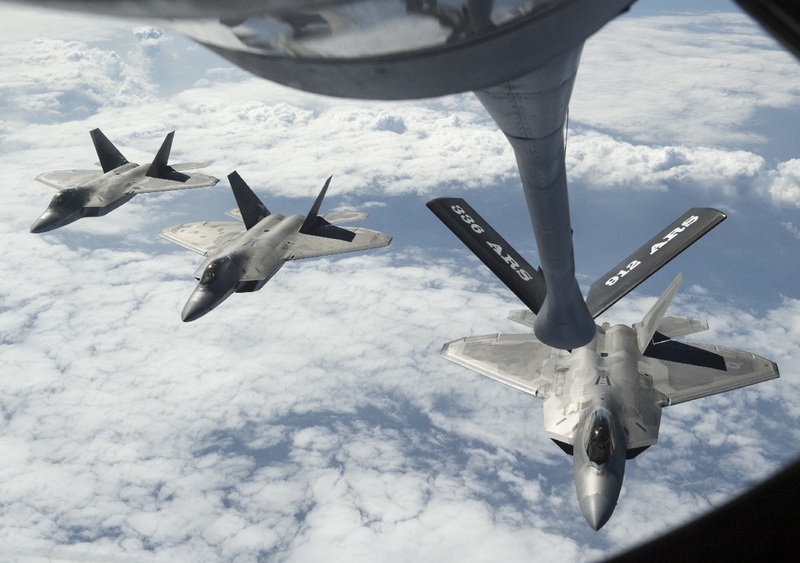 Filmed during Rim of the Pacific 2016, the world’s largest international maritime exercise , the cool time lapse video in this post shows four U.S. F-22 Raptors from the 199th Fighter Squadron and the active duty 19th Fighter Squadron receiving fuel from a KC-135R Stratotanker belonging to the 465th Air Refueling Squadron from Tinker Air Force Base, Oklahoma. Noteworthy the KC-135 refueling boom relies on hydraulic-mechanical infrastructure to perform its function, since it was developed by Boeing when it originally built the KC-135 fleet in the 1950s and early 1960s. Nevertheless the Stratotanker boom remains very effective when it comes to pass gas to the receiver aircraft. In fact even if the refueling boom of the more modern Boeing (former McDonnell Douglas) KC-10A Extender uses a fly-by-wire electronic control system, it’s able to pass 1,100 gallons of fuel per minute, a fuel transfer rate per minute which is not much greater than the 1,000 gallons per minute that the KC-135 boom can sustain. Twenty-six nations, more than 40 ships and submarines, more than 200 aircraft, and 25,000 personnel took part in Rim of the Pacific (RIMPAC) from Jun. 30 to Aug. 4, in and around the Hawaiian Islands and Southern California. RIMPAC provides a unique training opportunity that helps participants foster and sustain the cooperative relationships that are critical to ensuring the safety of sea lanes and security on the world’s oceans. RIMPAC 2016 has been the 25th exercise in the series that began in 1971.